German-Russian . . . communities were held together by specific human and divine values. Not least among these values were their dialects which were couched in spiritual, moral and ethical beliefs and feelings. The German colonist brought numerous dialects with them to Russia where their isolation created dialect islands cut off from their homeland. Most colonies were comprised of people from many regions of Germany and western Europe. Norka was an exception in that the overwhelming majoring of people had migrated from Hessen and Isenburg providing closer dialect and cultural ties amongst the colonists. The Norka dialect was distinct from the German spoken in the surrounding colonies such as Huck and Frank. There was much good-natured banter between the colonies about their distinct dialects. Catherine's Manifesto had granted freedom of religion and the right to establish local institutions without interference. Although not specifically stated, the Manifesto implied that the colonists were free to maintain their language which they viewed as integral to their religious beliefs. From the start of settlement in Russia, all church and school activities continued to be German. The church sponsored schools taught the children Hochdeutsch (standard German) which was like a second language to the dialect they spoke outside of school. After over 100 years in Russia, the reforms of 1871 began to put pressure on the German colonists to learn the Russian language along with their native dialect and standard German. Basic Russian language skills began to be taught in the village schools. In Norka, the so called "Russian" school was established about 1905. Two of the older Norka schools were replaced with new ones in about 1915. One in Oberdorf, and one in Unterdorf. The new and larger Russian school had been built next to the church in 1905 when we were ordered to learn the Russian language along with the German we had been wholly learning previously. Many people who lived in the city for years are ignorant of the fact that the mother tongue of these foreigners is German instead of Russian. Not infrequently some well-meaning citizen suggests that a pamphlet, or address, or bulletin be printed in the Russian language and distributed among the people down in the foreign settlements so that they may get the benefit of it, all unconscious of the fact that not one in a hundred can understand, speak, or read the Russian language. Although the colonists held tightly to their dialects, many Russian borrow words crept into their vocabulary over the decades. Examples include: Samovar (tea making apparatus), arbuse (watermelon), ambar (granary), plotnick (carpenter), bierock (pirog), ruble (a monetary unit), desyatina (a unit of land), pud (a unit of weight), verst (a unit of distance). ​A left-filled blue semicircle means Seife "soap" is pronounced "saaf" and kein "no, none" is pronounce kaa' (i.e. with nasalization on the final vowel in Dinges' example). The right semicircle is also blue. This means kaufen "to buy" is pronounced kaafe. The final -n is lost. The black "x" behind the circle means that there is an exception to when word final -n is lost. When word-final -n follows r, it is not lost, for example: fahrn "to go, travel", Ohrn "ears." The blue village name means that the speakers in Norka pronounce the initial p in Pfund "pound" and Pfeffer "pepper" like Low German 'p' Pund, Peffer and not like 'f'. The lack of an arc on the left side of the blue circle means gross "big" is pronounced groos ['oo' like the vowel in goat] and tot "dead" is pronounced doot. -d- or -t- is still pronounced like -r- boren "Boden" ruure "rote" hore "hat er". This characteristic is not consistently observed in the indicated locations. Middle High German "oo" (groos, doot) is pronounced "uu" (gruus, duut). For Müller and Preuß groos and doot have been observed. In all other High German villages groos, doot. Middle High German "ee" (wee, schnee) is pronounced "ii" (wih, schnii). Middle High German "öö" (bööse, schööne) is pronounced "ii" (biis, schii'). Middle High German uo, ie, üe (guot, bruoder; li-eb, bri-ef; müede, küe) is pronounced ou (au) e-i (äi), oi (gout, brouder, brourer; läib, bräif, moid, koih). In all other High German villages lieb, brief, guut, miid. Middle High German iu (from uu in hiuser and from iu in liuti) is pronounced oi (hoiser, loit). In all other High German villages lait, haiser. Wachsen is pronounced woose, wose. In Dinges' accompanying map of German dialects, Norka's dialect characteristics show them to fall within the blue-outlined area of the German homeland which is identified as West Middle German centered on the area northeast of Frankfurt which is consistent with the known origins of most of the original Norka colonists. Volga German dialect map by Georg Dinges. Linguistically, the dialectal features generally fit the Middle-Hessian dialect area of Germany, while others are found in Hesse-Nassau and South-Hessian areas, some find no exact correlation in Germany. This interview with Heinrich (Henry) Krieger of Norka, Russia was recorded in Portland, Oregon on February 2, 1974 by American Historical Society of Germans from Russia (AHSGR) members: Wilhelm Krieger, Peter Koch, Fred Krieger, Herman Dietz, Otto Weigel and Mr. Armand. Recording provided courtesy of Joanne Krieger, Portland, Oregon. A very large percentage of the colonists that settled in Norka in 1767 originated from what is now the state of Hessen in Germany. The Hessisch-Deutsches Wörterbuch (Hessen dialect - High German dictionary) is a very useful resource for looking up the meaning of dialect words not found in standard German dictionaries. 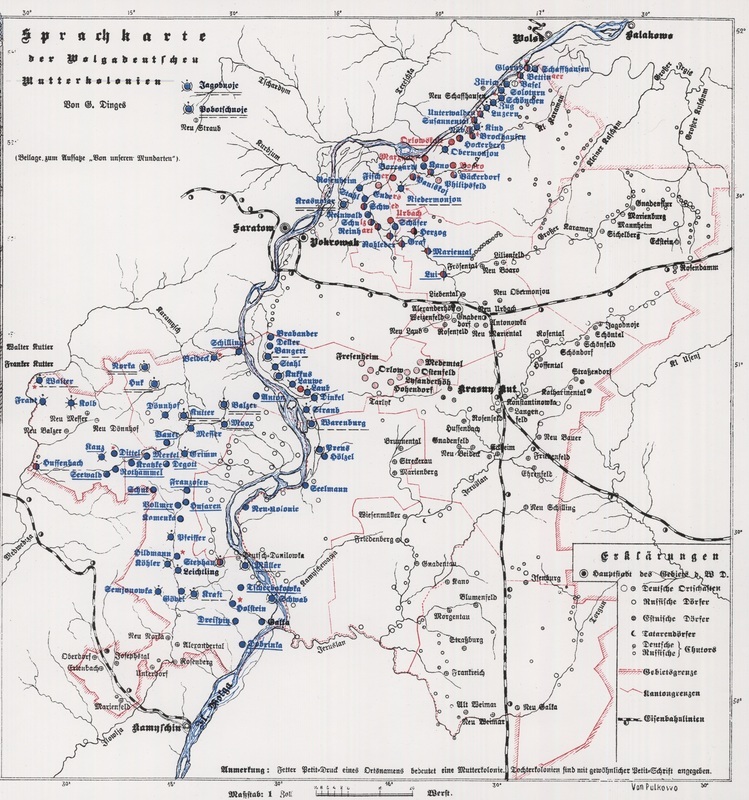 "Linguistic Map of the Volga German Mother Colonies (Map #30)." University of Kansas, n.d. Web. 29 Nov. 2014. <http://www2.ku.edu/~germanic/LAKGD/Dinges/Dinges.shtml>. Also available in print from the American Historical Society of Germans from Russia. Marzolf, Arnold H. Let's Talk German-Russian with Ernschtina Un Hanswurscht. Bismarck, ND: Published under the Auspices of the Germans from Russia Heritage Society, 1990. Print. Tuck, Mary Lynn. Sekundärsiedlung Einer Ausseninsel (Norka-Wolgagebiet) in Lincoln, Nebraska: Bestimmung Der Sprachlichen Urheimat. Doctoral Dissertation, University of Nebraska, 1983. Print. Williams, Hattie Plum. The Czar's Germans: With Particular Reference to the Volga Germans. Ed. Emma S. Haynes, Phillip B. Legler, and Gerda Stroh. Walker. Lincoln, Neb. : American Historical Society of Germans from Russia, 1975. 7. Print.